Re. 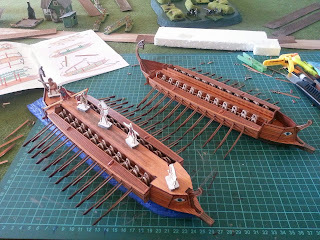 galleys.... UMBUM make a 'bireme' of which I bought two some years ago but got sidetracked and never made them. Now I have. Why did I wait ? I ask myself and am now making some fun rules for small actions. Maybe 6 can fight on a tabletop. The models go together so well and look so good it is inspiring. They even have some nice surprises hidden for the casual cardboard.galley constructor! The model is a 'Grecian Bireme' made at 1/87 scale. 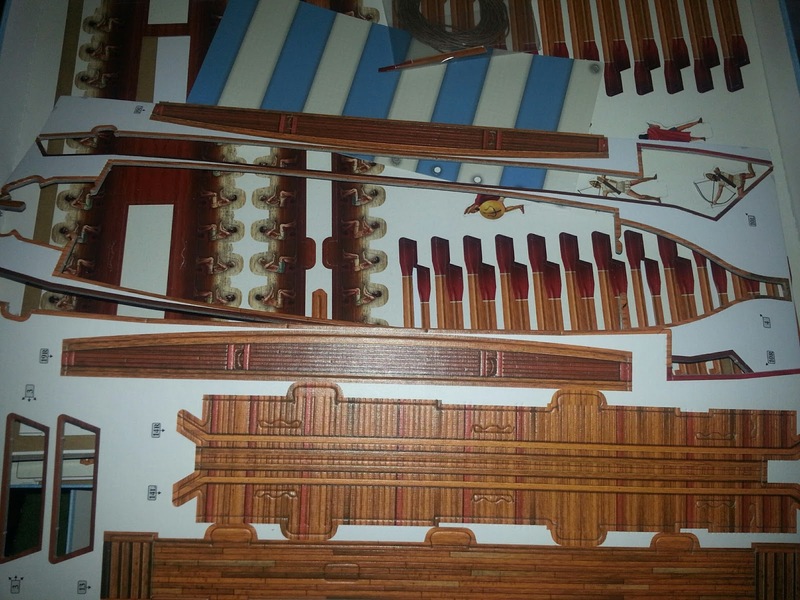 It is in fact a dikrotic penterkonter - a double-banked fifty-oared galley. The model has a hint of 'Olympias' in its design but is sufficiently accurate to make a great '2' for gaming with. 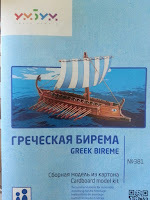 There is a sail and detailed instruction for rigging but no 'artemon' - the small bow-sail. The model requires no glue and no cutting. It is a pre-cut, press-out kit. I made two models and I have had NO tears or poorly cut pieces. The main members go together with a patented self-locking tab closure which is very neat and very effective. The coloured surface is fantastically detailed and gives an excellent final finish. The model would do for the period c.800B.C. to 50B.C. and even for Imperial Rome with eyes squinted. Despite it being a '2' - a '3' would be nearly twice as long at this scale - one can have games using the model as a generic 'trireme' or 'Liburnian'. Thinks I. The model is made from 2.5mm card with a glossy, colour-printed paper surface. It can be wiped clean if excess glue or paint gets spread on it. The raw edges can be coloured with a felt-tip to make them less obvious. The instructions are clear and I found no problems. I fall in the 7-99 year age range for the model, apparently. What is so fantastic with these models is the way they go together. The press-out models of my youth were Stone-Age compared to this. 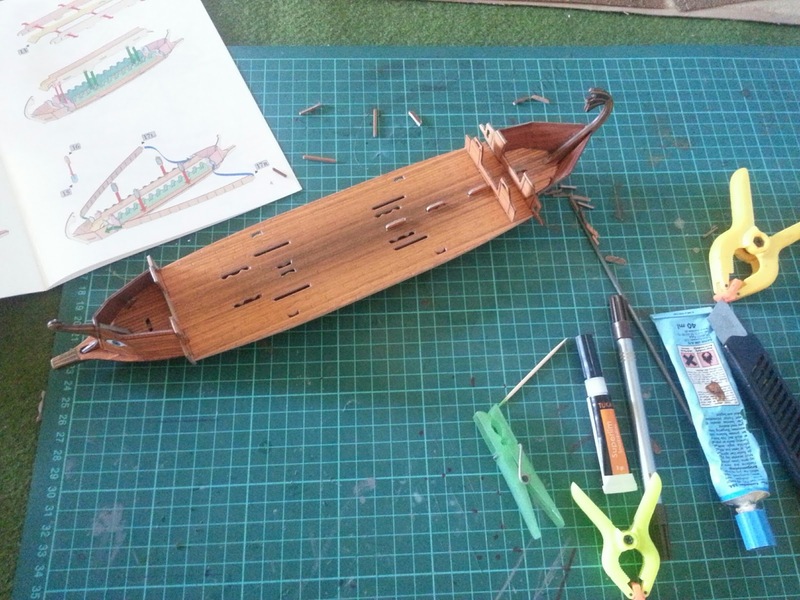 The only places I used glue were 1) to stick the stem and stern posts solidly together and 2) the screen on the outrigger ( which can stay in place but looks better when evenly secured). No knives. No glue (to speak of). 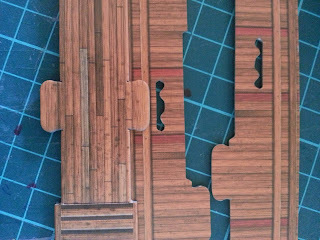 No nothing except a cocktail stick(supplied) to press the smaller pieces out. Amazing! The final touches are the sail and the crew. The crew is provided. There 50 oars and fifty men to row. Cardboard cut-outs yes, but they fit the model and look fine. 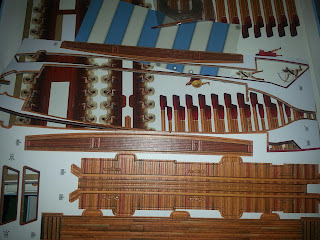 I am examining the way I may replace them with cast resin sets of ten 3-d rowers but that is for the future. There is also a set of 5 epibatai - 2 archers, 2 spearmen. one officer and one man in a tunic with a sword (?). 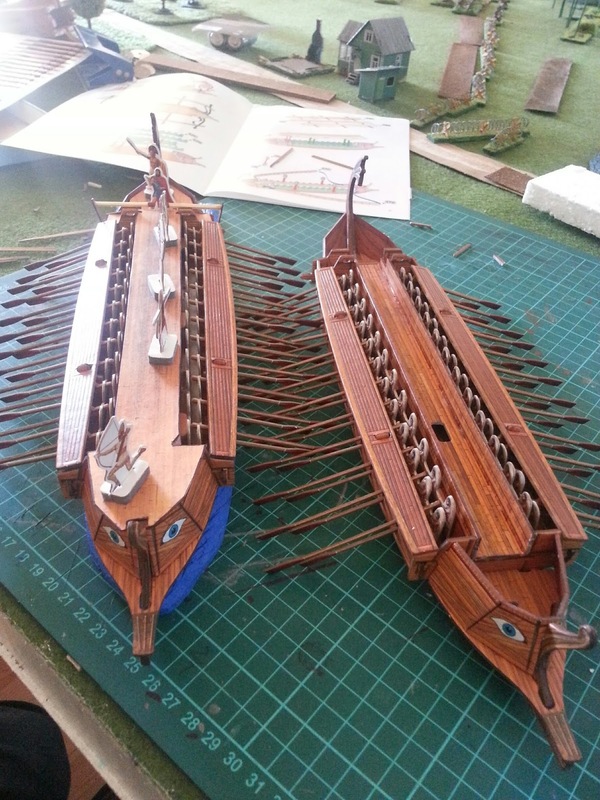 These are nearer 30mm than 20mm scale, as are the rowers. They go well with Junior General's figures or the Greeks and Persians from PERMES. Any wargame figures in metal or resin would work also in 20-25mm ranges. 28mm would be a bit wierd, I think, unless one replaces the crew with larger figures.or hides them with screens and decking. The model takes about an hour to complete. 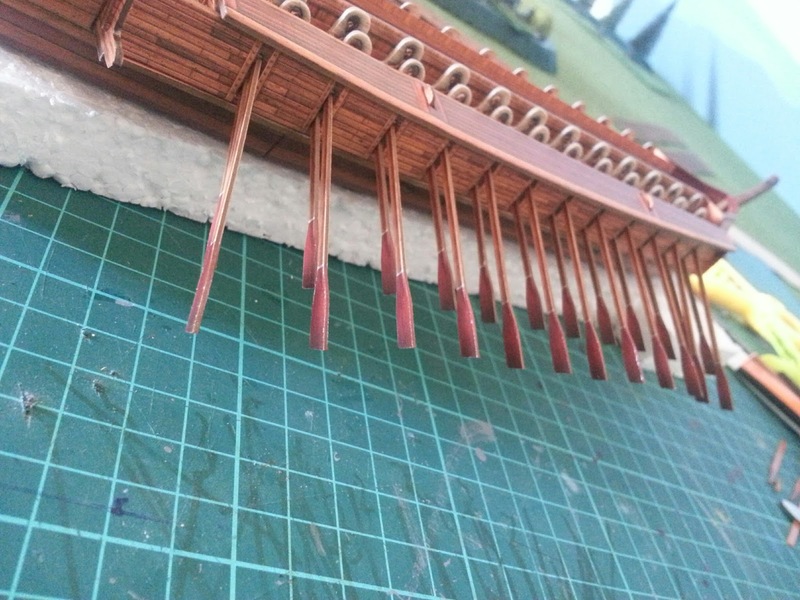 Left model with added poop, focsle and main decks. The focsle and poop are a bit awry on the model. There should be over-decks to them. Under the focsle and poop were the sail/rope lockers and the only covered space, maybe some was used as a cabin for the senior crew ?. It is easy to scan the largest pieces of deck and print onto card some planking, from which one can make the requisite decks. 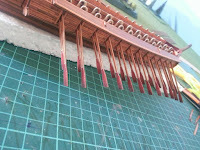 Railings can be made from card or ccktail sticks or plastic sprue. I am still thinking about adding small bits and bobs. 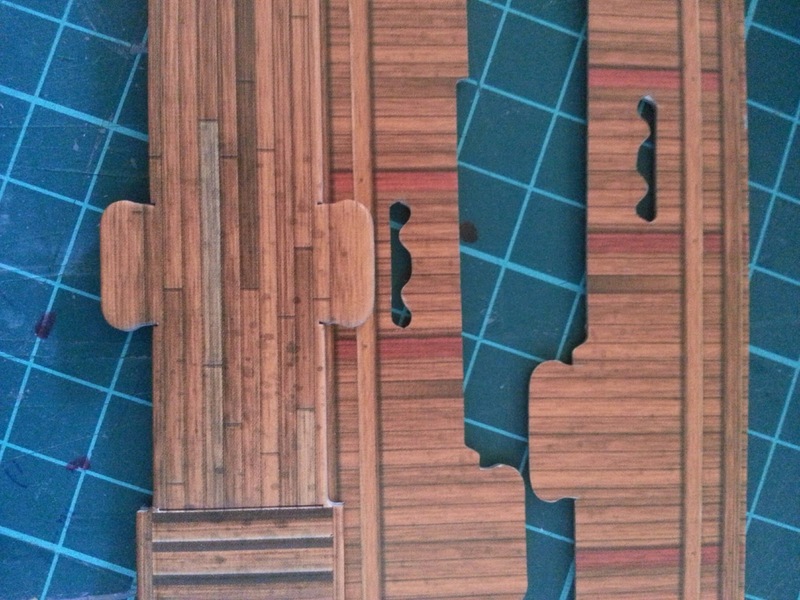 I trimmed the most obvious construction tabs so that they did not stick-out to much. 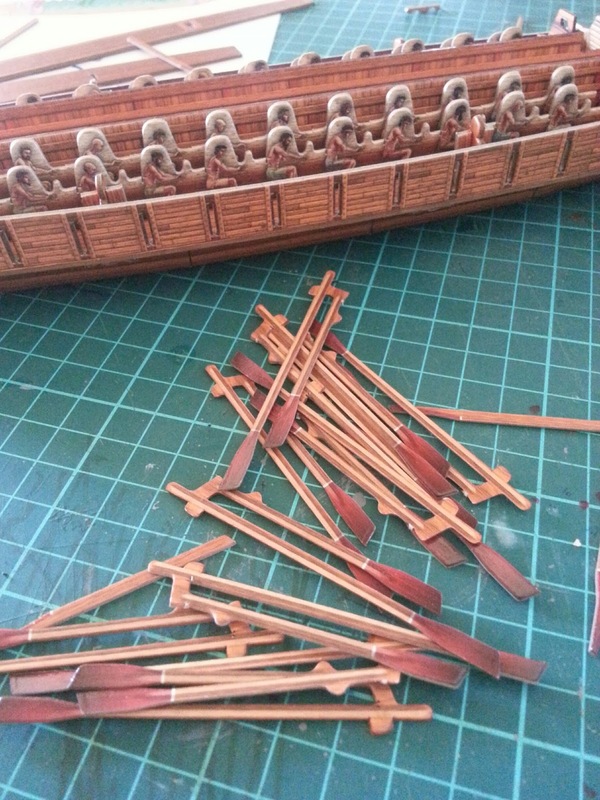 The steering oars require added tillers to reach over to the kybernetes. Matchsticks work well. 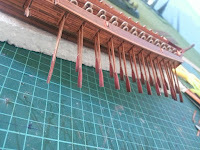 I coloured all raw edges before I assembled the model. 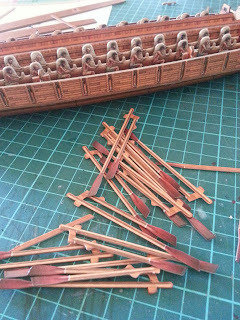 As I made the model I discovered the rowers were not clipped fast in place... No indication was given on the box or instructions... then I realised...THEY ROW! A small thing, but the rowers can be pushed back and forth and thereby the fifty little cardboard oars swivel back and forth in unison. Such a satisfying experience after building this excellent kit. The models can still be bought from UMBUM or Russian Best. There are many other good card models in HO-OO scale for wargaming in their range. The prices have gone down ! because the Rubel has devalued but reckon with postage and Told and Tax of 25% plus investigation fee which in Denmark knocks the price up by about 66% ! All in all the models cost about 16 dollars each. This is considerably cheaper than the Revell or Zvezda counterparts in moulded plastic. 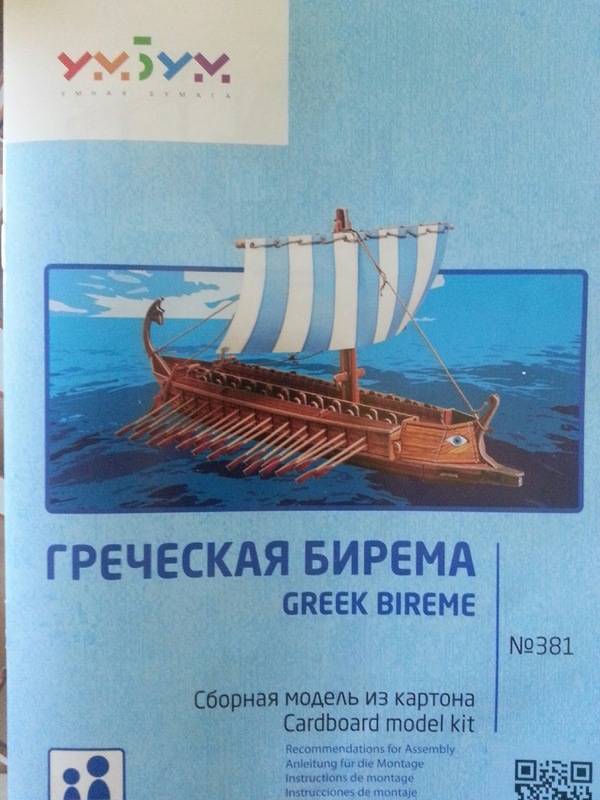 * Actually, Умная Бумага, shortened to UM BUM means 'clever paper' - very apt.